By: Kerry L. Knapp, Ph.D.
A Cadillac sedan was hit from behind by a Pontiac sedan. The driver of the Cadillac testified that the Pontiac was traveling 60 to 65 mph at impact. He alleged that at the time of the collision his left elbow was bent, his left hand was on the steering wheel (palm up) at about a 7 to 8 o'clock position, and his hand was forced into the wheel by the impact. 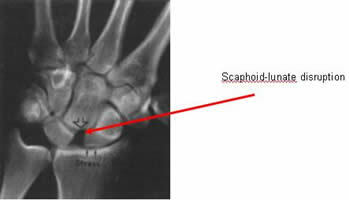 Could this collision have caused a complete scaphoid-lunate disruption? mph (not 60 to 65 mph) and the change in velocity was 12 to 16 mph. Based on the occupant kinematics of a rear-end collision, Northstar Biokinetics determined that the driver of the Cadillac sedan would not have moved forward at impact into the steering wheel. Northstar Biokinetics concluded that the forces involved in the incident were not consistent with complete scaphoid-lunate disruption, but rather were the result of long-term repetitive stresses on the wrist from elite-level sports, weight lifting, and daily repetitive push-ups. Dr. Kerry Knapp has a strong educational and experience-based background. Educationally he is grounded in physical sciences, engineering, and computer modeling with bachelors and master degrees. His doctoral work, which was focused on analytical techniques, provides the theoretical for Northstar Biokinetics rigorous analytical process while recent studies and research in human functional anatomy, physiology, human neuroscience and human biomechanics form the basis for current case analysis work in injury biomechanics. Broad personal experiences in the areas of aviation, boating, sports, agriculture, and construction add experience-base understanding to all aspects of case analysis. See Dr. Knapp's Profile on Experts.com.